The Sea Cliff Village Museum strives to raise community awareness by preserving artifacts, documents, photographs and costumes relating to the unique historical background of the village. The Sea Cliff Village Museum strives to raise community awareness by preserving artifacts, documents, photographs and costumes relating to the unique historical background of the village. 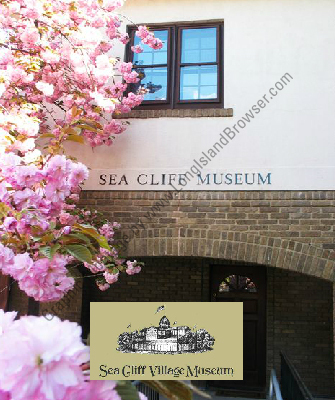 The Sea Cliff Village Museum, founded in 1979, is sponsored by the Village of Sea Cliff and the Friends of Sea Cliff Village Museum. It operates under the direction of a board of trustees and a director / curator appointed by the Sea Cliff Village Board, with valuable assistance provided by the Friends organization. The museum's function is to collect, preserve, interpret and display material relating to the unique historical background of Sea Cliff, focusing primarily on the village's Victorian and 20th century heritage. In addition to the maintenance of permanent displays, the museum mounts two special exhibits each year. Guided tours for school classes and other groups are available by reservation. Special lectures, slide shows and day trips provide the museum with an opportunity to reach a wider community. H. 0. Korten Photograph Collection. An extensive photograph collection includes 287 glass plate negatives by H.O. Korten, a Sea Cliff resident and well-known Long Island photographer. Prints from these, together with over 900 postcards, provide a valuable social history of Sea Cliff at the turn of the century. A period kitchen features old-fashioned appliances and equipment, recreating the warmth, as well as the work, of everyday life at the turn of the century. The development of a significant collection of apparel spanning the late Victorian era to the 1930's is in process. The museum actively seeks period bridal gowns, dresses, suits and accessories and carefully preserves them for use in conjunction with exhibits. The Connor Cottage, a scale model of a Sea Cliff home which belonged to the late Edward C. Knieriem, was a gift from his estate to the museum. The actual house, located on the corner of 17th and Central Park, still exists as a private home.